Livelihood .... the way we make our way in the world. What if it were illegal? What if it were unethical? What if it damaged the environment? What if it damaged our health? Never thought ones livelihood was such a messy issue did you? but our actions and work has consequences and these consequences effect others and the environment and our world and eventually ourselves. It is truly a small world of sorts. So how do we sort through this mess or does the market or should the market be the sole arbitarator of what is good and right. Yet oft in its glee for profit and gain the market assigns the spoils of its enterprise to no one. Whos going to pick up the trash that the market produces or does the market decide? Well it depends. There are those that see an opportunity and go for it and that has its place but there are perhaps other considerations, holistic considerations. Some say Government is to big and that the market should rule but the market does it have a conscience? They say that when a society reaches a certain stage of viability then such concerns have a tendancy to surface and this is how we progressed from the farms and homesteads to the cities. Yet it seems a complex system of a lot of mumbo jumbo and red tape at times and is it really better than the market place? I don't know I don't have the answers and its just another one of those things to consider when deciding upon the sustainability and viability of ones career choice and such. Do we need to think about the future when it seems hard enough worrying about the day or do we just live for the day. Choices and decisions we need to make in the course of our lives. Whether its possible to meet all the crieteria and find that dream job is probably unlikely and you're probably going to be steppin on someones toes or at least at some point. Since a long time, one of the subjects I'd like to delve more into and write about is the subject of making realities. That could be addressed from many angles. Personal Reality. Shared Reality. Virtual Reality. Now, that's starting off with an assumption that each of us have a hand in what reality we're experiencing. Some people don't believe that. Even some of those people who're best at constructing realities that they get others to live in. Many people will insist that reality just is some kind of objective finite thing which one can establish and prove and that's it. Ironically, some of those people probably live more in a reality inside their skull than outside it. But that wasn't my point. The way I use reality here is as that which we can perceive ourselves to be living in, and which we actually can live in. There can be several or many of those. One might live in one without being conscious of it, or one might willingly step in or out of different realities at different times. You can think about a movie, for example. If it is well-made and you enjoy it and you're watching it in a movie theatre, you can live yourself into it and believe it while it is playing. Oh, you're still aware that you're watching a movie, but if it is made well enough, you'll forget it to a considerable degree and it will be real, and you have some kind of relation or response to the characters and situations in it. Even if what you're watching is really photos of a plastic model and actors pretending to be other people than they are, you might go along with the whole thing. Good film makers and good actors know a bunch of things about making convincing realities. For example, a method actor would work hard at developing a lot of invisible things that are part of the character they're asked to portray. Like, what is their past history? What are their feelings and actions rooted in? What is really motivating them? What do they feel? What happened to them before? Where are they going afterwards? Even though you see none of those things directly, if the actor has chosen for himself what they are, his character will appear more real to him and to you. A very simple example: If a character is supposed to say a sentence that gets interrupted in the middle, like "But why do ...", and then something happens. If the actor only practices saying "But why do .." and then stopping, it will look and sound kind of fake. It will work much better if he worked out for himself what the whole sentence should be and why he's saing it, even if he never gets to do so. The fabric of the reality he's presenting is more coherent and complete. And you notice that, even if you only get to see a corner of it. Realistic realities have a number of perceptions to them, and they have depth. It is not just that the right words are said. They sound right, they look right, they smell right, they feel right. The periphery seems right. If you say the word toothbrush, it doesn't count for much. But if you can hold it in your hand, and put toothpaste on it, and put it in your mouth, and clean your teeth with it, and your mouth feels nice and fresh, then it is a convincing reality. It doesn't matter if somebody else thinks it is a hairy-nosed wombat. If you can brush your teeth with it every day, and have a minimum of cavities, you're fine. No, it doesn't quite mean that it is just as good to live in a delusion as to live in a reality. A delusion would be when you exist in a certain reality and you deny it, and maintain the abstract idea that it is different than it is. A functional reality is made of perceptions, not just of a concept. Perceptions are abstractions too, in relation to what the universe REALLY is, but they're much more solid than recooked abstract concepts that are based on denying perceptions. Important difference. If you sit by a table and you tell yourself you're flying a spaceship, you probably won't be doing anything very sensible. If you can actually operate the controls and land on another planet and pick fruits off the trees, then you might actually have something. If you're only thinking: "This is not a table, it is a spaceship", and you convince yourself, then you're probably just a human who'll have difficulties functioning. Affirmations are a common newagey way of getting something you want to happen. Nothing wrong with that. Prayers are in the same category. It can be quite useful to affirm or ask for that which you want. You might get it. Better than not to ask for it, or to ask for that which you don't want. But it is also very flimsy as far as realities are concerned. Just a concept and some words. To really get something different, you need to feel it, see it, hear it, taste it. You gotta be able to get into it and drive away. 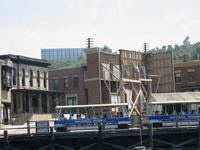 If you only have a movie prop facade, like from Universal Studios, you can't live in it. Workable realities have a whole range of dimensions to it. You can't eat a picture of a cheese. It needs to have a certain consistency, it needs to taste right, and it needs to be nutritious. There's a whole bunch of perceptions and details that need to be there. Realities have a lot of detail, and detail that is not just on the surface, but which sticks quite deep. However, if we don't need to eat it or live in it, we can be persuaded to accept realities that really are rather flimsy, and which aren't much more than props. But they're detailed enough that we'll accept tham as real without actually inspecting them. You'll probably accept the news and the state of politics in that manner. You don't really go and double-check the news for yourself, to see if it is real. You might check some other sources, but you'll probably stop when you feel you have a picture that is sufficiently self-consistent. It is still just a concept, and has the real substance missing. It is pictures and words and opinions. But it is impractical to get the real thing, so you've become used to accepting a prop. And you're just looking for a certain coherence of the picture, rather than whether it really is edible. And most likely you vote for political candidates the same way. You haven't met any of them. You've just seen them on TV. So, the people who design mass realities for us have a much easier time than what would be required to design livable realities. You don't have time to receive much more than a cardboard cutout, so their job is simply to provide a cardboard cutout that seems to suit you, and which will survive its journey through the news media, and which will fool you sufficiently. It doesn't have to be the truth and it doesn't have to add up. But the same rules still apply. You just need less of them. For example, if a certain political character is presented as taking a certain stand, you'll want to hear the history that let up to that. I.e. you want to hear about a background that is consistent with what they're presenting. And you want them to sincerely look like they're playing that part. And you want other people to confirm it. Whether it is the truth doesn't matter. It is obvious that you can't add up everything, so you'll settle for accepting things as more real if you've heard them enough time from people who look like they know what they're talking about. And their story makes sense to you. You'd want to know about how realities are made in order to protect yourself from mass manipulation. And for your own sanity you'd want to know how to make your reality that which you prefer. Personal realities are on one hand harder to make than mass realities, because they require more detail and self-consistency. On the other hand they're easier, because there's mainly one person involved, and because the things that make the most difference in your life are rather subjective, and don't really need to be validated by anybody else. Some people accomplish great things and breeze by even the most impossible obstacles. That's not just because they're gifted in that way from the beginning. More importantly it is because they implicitly believe that things work that way. They don't just believe that as a loose and shakey idea. They feel it, see it, hear it, taste it. They have experiences to back it up. They're both coming from somewhere and going to somewhere that is well-defined, self-consistent and in accordance with that which they're accomplishing. And, no, not just because that's what REALLY happened. Mainly because THEIR reality is structured that way. The reality you're seeing and touching might appear very real, but it is in no way THE reality. It is probably more real than many of the delusions one can have ABOUT the reality. But as far as the universe goes, there's no scarcity of options. The table you're sitting by is probably just one of zillions of possible tables. The sub-atomic particles it is made of could be in any of an unfathomable amount of states, and they probably are, at the same time, depending on who's looking. You could call that parallel dimensions, or the quantum soup, or Reality with a capital R, or whatever. Regardless, any insistence on that table, or your political views, being some kind of only and ultimate reality is laughable on the scale of infinity. Time and space are but somewhat illusory properties of the way you happen to perceive things. The same pieces appear in so many other guises, at the same time, the appearance of which has a whole hell of a lot to do with how you perceive them and interact with them. Maybe it is a little pretentious to call it "making" or "creating" realities. It is maybe more like choosing. Every possible different perception you might have about anything at any time forms a possible branching point. Nobody forces you to take any one of them. There might be some inertia going on, but you're always free to start branching off in a different direction at any time. But it helps to know what realities are made of. Detailed perceptions. A coherent and consistent history. Depth. Multiple levels that all work. Systemic synergy. Things fit together. And for us humans: a meta-story, a set of beliefs about how and why it works. And realities have a certain continuity. They don't flicker on and off all the time. They're there even if you look away and look back again. I like to make complicated things simple. The world we live in is mostly upside down and inside out. Simple things are made terribly complicated. And things that are very complex are made very simple. Falsely. You'll often find the amazing infinite complexity of the universal organism reduced to a few simple platitudes. Religions are very good and degrading into that. Here you go, all you need to know about life is to follow these 10 rules. And it becomes terribly complicated to just exist. You have to keep track of loads of abstract and self-contradictory disjointed information. Most people don't get around to the simplicity of just being present. It is really quite simple. Or complex, if you will. We screw it up by abstracting. Abstracting in the sense of forming abstract notions about reality, and then getting lost in the abstractions. Lying in the grass, looking at the clouds drift by, feeling a light breeze, listening to the rustling of leaves - that might be complete and whole in itself. The simple enjoyment of life. As might be the satisfaction of figuring out the periodic table of elements. But when you try to pack it up and take it with you, trouble easily starts. You might accidentally assume that your experience is THE experience, and you might persuade others to adopt a symbolic version of your experience, rather than having their own real experience. And since that initially seems to work, we easily get further and further away from the real world, which is both complex and simple. And we end up in shadow worlds of the mind that are simple and complex in the wrong places. But sometimes we wake up and feel the breeze. And sometimes the condensed learnings of others help us do so, or help improve our lives. So we easily forget that most of the time we're wallowing in misplaced abstractions. We all share the fault, of course. We seem to think we're something that we really aren't, thinking we're capable of something we really aren't. And we're not noticing that we really are something much grander. Knowledge or what is and what may be. In this article I seek to answer the question: “Why do I believe what I believe?” This is a key question; one which must be answered by anyone seeking to teach and more importantly, by anyone seeking to add to the overall pool of knowledge. In physics we see that as we approach the speed of light it takes ever greater energy to create ever smaller accelerations, until, at the speed of light, it takes infinite energy to create any acceleration. We cannot go faster than light. In knowledge we see that as we approach truth, it takes ever greater thought to make ever smaller improvements in our model, until, at truth, it takes infinite thought to create any improvement. When our model accurately reflects truth, no improvement is possible. Every now and then in knowledge, a person has an Einstein moment. Einstein saw that Newton’s Laws of Motion apply only under normal circumstances, which lead others to Quantum Physics. At that moment, as the electron makes its quantum leap to a higher or lower state, knowledge as a whole, made a quantum leap into a new and advanced state. ONE: We can now say that the velocity of knowledge growth is lumpy except when arbitrarily near to the current model of truth. From history and statistics we can now import the concept that the overall growth of knowledge is accelerating. As our current model approaches objective truth the lumpiness will average out, the acceleration will slow and knowledge growth will eventually stop: That is, unless an Einstein moment occurs. Should one occur, as seems likely, then the entire knowledge base will change and the lumpy acceleration will once more start; new growth towards a new and better model of truth occurs once more in normal mode. Therefore, we have a test for the question “Are we close to the current model of truth?” The lumpiness of growth in the knowledge base is an objective standard measuring how close we are to the current model of truth. The closer to the current model of truth, the fewer new concepts are being added and therefore the flatter the curve of knowledge growth. a)	Is there any political pressure being applied to supporting the current model? From our knowledge of fear in groups we can say: The more political pressure being applied in favor of the model, the greater the odds are that the model is wrong. b)	Are there any data points in the current model which are wrong or probably wrong? From history of science we can say: The greater the chances of one or more error points, the greater the odds that the model is wrong. c)	What do our elderly and distinguished experts say about alternate views of the model? Again from history of science we can say: The greater the pressure from experts deriding an alternate view as impossible, the greater the odds are that an alternate view is the correct one. This comes from the observed concept that when an elderly and distinguished scientist says something is possible, he is almost always right: When the same scientist says something is impossible, he is almost always wrong. Now we can use our theory of knowledge to look at individual models of reality. From my point of view, wishing to understand spiritual growth as a tool of healing for damaged men, two of the models I most desperately wish to know about are the current model of gender and the current model of spirituality. So I ask “How lumpy is the current growth of knowledge in gender?” That will tell me how close we are to the current model. After spending almost a year searching for scholarly articles on gender I can give as my opinion the statement that “knowledge growth in the field of gender is virtually flat.” All articles are rehashing of previous knowledge and do not include testing for concept errors. Next I ask “Is there political pressure being brought to bear to support the current model?” The answer, based on the rather extreme damage done to people questioning the current model, is a resoundingly loud “YES.” The problems which Murray Strauss and Doris Lessing faced are only tiny examples in the sea of bigotry thrown at anyone disagreeing with the current model of gender. Next I ask “What do our elderly and distinguished experts say about alternate views of the current model?” Almost without exception the experts deride and disdain all alternate views of the current gender model. Therefore, I can say with reasonable assurance that we are, knowledge wise, arbitrarily close to an incorrect model of gender. We need a breakthrough to a new and better model of gender. So I now ask “How lumpy is the current growth of knowledge in spirituality?” After looking at a great many articles and books I can offer my opinion that the growth of knowledge in spirituality is quite lumpy. In fact, knowledge of spirituality is so severely fractured that I can go further and say that there is no currently accepted model of spirituality. I now ask “Is there political pressure being brought to bear to support the current model of spirituality?” As the growth of knowledge in spirituality is so very lumpy and political pressure is being brought to bear on a great many models of spirituality I can say that this question is not answerable. “Are there any wrong or probably wrong data points in the current model of spirituality?” It seems to be clear that there are error points in a great many of the models of spirituality. “What do our elderly and distinguished experts say about alternate views of the current model?” Our experts are of a great many opinions. Therefore, I can say with some assurance that there is no currently acceptable model of spirituality.